Throughout the winter, you probably pay less attention to your lawn than any other time of year – particularly if you live in a colder climate. Your lawn may not be visible underneath a thick layer of crisp, white frost or snow, but out of sight shouldn’t mean out of mind for your grass. Lawns require less maintenance during the winter months, but they do require some upkeep to spring up green and beautiful this upcoming spring. 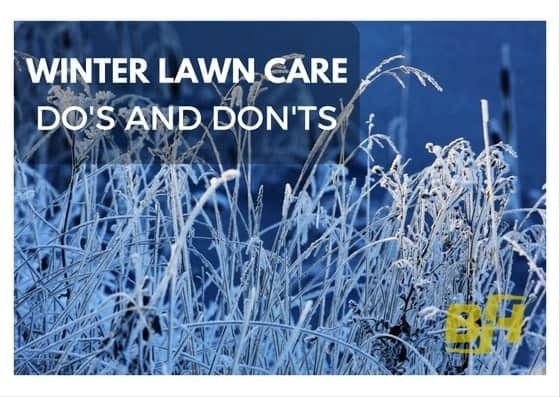 By following our list of lawn do’s and don’ts during winter, you can minimize damage to your lawn and guarantee lush, green grass after the snow melts. Late fall and early winter are the best times to fertilize cool season grasses, such as Bermuda and bluegrass. If you live in North America, there’s a good chance your lawn consists of a cool season grass blend. Fertilize your lawn before the first frost sets in – sometime in late-October or early-November if you live in a very cold climate. Your lawn’s soil will lose nutrients throughout the summer months, so fertilizing during the fall or winter can help replace them before the following spring. When your grass is long throughout winter, it can become home to field mice and burrowing animals. These creatures may be cute, but they will tear up your grass and cause substantial dead spots if they’re allowed to burrow in your lawn. As the colder months set in, begin to gradually mow your lawn shorter and shorter. Your last mow of the year should leave your grass much shorter than it would be during the summer months. The shorter your grass, the less likely burrowing creatures will be to use it as their nest. Weeds are usually more of an issue during summer than winter, but you may be surprised at how many weeds can withstand the cooler months better than grass. When your lawn isn’t covered in snow or frost, take a quick look for any weeds which may have taken hold. Pull out any weeds you find instead of letting the issue take hold. Weeding in the cold may not sound like fun, but stopping the problem before it begins will save you time and energy come spring and summer. Grass becomes dormant after the cold sets in, meaning it won’t grow until the weather improves. Cutting dormant grass can lead to long-term damage and even kill large portions of your lawn. Most grass will become dormant after the first frost – sometimes long before, but you can be certain it’s ready to stop growing after the temperatures dip low enough for frost to form. Don’t cut your grass after this point to avoid long-term damage. Lawns don’t require as much maintenance during the winter months as the spring and summer, but some care can prepare them for dormancy and improve their health for the following year. If you’d like to know more about winter lawn care, contact Bur-Han Garden & Lawn Care to speak to one of our team members. We offer year-round lawn care, and we’d love to help you prepare yours before the first frost.